Every so often I notice a recurring theme in my day-to-day life. The theme seems to involve anything from events that are happening to similar occurrences in the news, or something as simple as things people say at various times over the course of a week. This past weekend’s recurring theme was baskets. I’ll let you dirty-minded sorts chuckle on that one for a minute, just to get it out of your system. Done? Good. Because I’m not talking about those kinds of baskets. In fact, the types of baskets I am referring to are a little more literal than that. Each held something important, and each represented something special. Each touched me in a special way, and each had something to do with one another. This past weekend was my sister’s baby shower– which itself is an unusual circumstance, seeing as how the twins were born in February. My mom did most of the work on the party (I helped whenever I could), and one of the things we — well, actually, she — decided to do for the event was to make our own edible fruit arrangement. I’m sure you’ve seen these – sliced melons and shaped pineapples arranged in a basket or a planter with strawberries and grapes. They’re visually striking and usually very expensive, so my mom decided we could, and would, make our own. While it wasn’t technically a basket (we used a ceramic flower pot), the look is that of a huge basket of fruit- therefore it’s one of the baskets of this past weekend. I have to say, it turned out great. I’m really proud of what we produced- but in no way do I foresee this being a cottage industry for us. These suckers are a lot of work to create, and by the time we were done we were both exhausted. We certainly understand why they are so expensive! Before I was born, she created a lamp for me featuring a white teddy bear sitting in a bed of daisies. I had this lamp in my bedroom for many years, finally putting it in the basement sometime before I entered high school. Shortly after she was born, my sister got a lamp featuring a figure of a little girl wearing a green dress, holding a doll and a wicker basket. Her lamp, too, ended up in the basement, and for the past 15 years or so, they both sat on a shelf and collected dust. I found them over the weekend as we were preparing for the party and decided to clean them up and bring them as a surprise for my sister. The lamp mechanisms were both in bad shape, but the bases looked to be just fine. I brought them both upstairs and started cleaning them up. I started with my sister’s old lamp. I removed the lamp mechanism, filled the sink with water and placed the lamp base in the water and started scrubbing. As I cleaned the figure, I noticed a gummy substance coming off the figure. I quickly realized this was probably glue. I removed the figure from the water and let it drain before proceeding, but it was too late- the figure came apart in two pieces. Apparently it had fallen at some point in history, and it had been together using Elmer’s Glue instead of Super Glue. Great. I drained out the rest of the water from inside the figure and let it sit to dry. As it sat, I noticed the basket started to fall away from the girl’s hand. I hadn’t even realized it was broken, but upon closer inspection, I realized it had not only broken, it had been extensively repaired and made to look like nothing had happened to it. My dad was a pretty good artist. He was good with paints, markers, whatever he could get his hands on. He was always creating posters and signs, and drawing pictures and cartoons. Many times I can recall him repairing broken items with plaster and paints, and when he was done with it you couldn’t even tell anything had happened. As it turned out, the basket the girl was holding was broken into tiny pieces. As the pieces came apart in my hands, I realized how much effort my dad had made to repair this basket so it looked like new. He probably used Elmer’s glue because that’s all he had available at the time — he just wanted to fix this lamp and make it look great for his little girl. That’s the kind of man my dad was. I did the best I could to restore his handiwork, but by that point a lot of the pieces had become ragged and the plaster my dad added was soft to the touch. I reshaped and re-fit the basket as best I could and put it back on the figure. I then put the top of the figure back on the base and secured it with Scotch tape until it was secure. It looked okay, but it would need some explanation as to why the basket was so badly broken. I cleaned the Teddy Bear with Windex and rinsed it under water instead of submerging it– I had learned my lesson. As far as I knew, my lamp had never broken like that, but I didn’t want to take any chances. In the end, both of them turned out fine and we brought them both to the party and presented them to my sister for the girls. Needless to say, she was surprised. And even though the basket was broken and held together with tape, she got a special gift that she can now pass on to her daughters. With love, from Nana. About a month ago, my mom called me up to tell me about something she wanted to do – a church around the corner from our house was having a food sale – for $30 she can get a full basket of food and for an additional $20 she can get some extra items. With food prices being so outrageous, and her income being so limited, she took interest in this program, and wondered if I wanted to go in on it with her at all. One of the “special” items was an assortment of meats, which would come in handy for my camping trip around July 4, so I agreed. The catch was that we had to pick up the food at the church on Saturday, the day before my sister’s shower. Seeing as how I was going to be in town anyway, we agreed that wouldn’t be a problem. At 3PM, Mom and I were deep in the middle of preparing our fruit arrangement, and I had to leave to pick up the food. I grabbed a few “green” shopping bags and headed over. I expected a possible crowd, but I didn’t expect the crowd I saw. There was a line snaking out the door of the church and into the parking lot. People were there with boxes, bags, carts, and baskets. As I stood in line, I overheard many people talking. The family in front of me drove up from Milwaukee. Another family came from southern Illinois. All of them spoke of how difficult it was to buy groceries when they are so expensive, and how much this program means to them. They were hard-working, lower- to middle-class people, who were merely trying to put food on the table for their kids. I felt guilty standing there, knowing I can afford to feed my single self on my salary. But I also knew the money went to a good cause, and helped the organization continue to do what it does. As I went through the line, I watched the other people as they received their food. They were so thankful and so happy to get these items. Everyone was friendly and helpful, making sure the elderly got a hand bringing their food to their car, or helping a large family with more boxes for their supplies. Sure, the quality of the food may not be as good as what you get at Whole Foods or even your typical supermarket — but it is food, and they need it just like anyone else. When I got home and unpacked the bags, I told my mom we would keep the food in her freezer until we needed it. 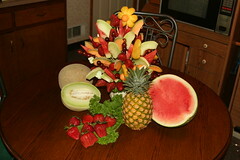 She agreed and we went back to creating the fruit arrangement. But I couldn’t help but think of those families who came from so far just to get a box of food. It made me wonder why we were doing something that seemed so excessive, so unnecessary. Three “baskets,” three different stories – but all added up to a pretty special weekend. Oh, and here is one last “basket” – a baby basket! Abby and Emily are now just over 4 mos. old and getting cuter by the minute. Proud Uncle Rick, signing off. Previous postSchlameel, Schlamazel! Hassenpepper Incorporated! If I weren’t in a cafe right now in the midst of a bunch of people, I’d be crying over that Nana basket story. Very very cool. My Grandmother also liked to “do ceramics.” I used to have a lamp that was a fawn sitting on slice of a tree, I wonder where that is now? And I have a “Smiley Face” guy that she and I painted together and I remember how I mucked up the trim on it, but she made it all better – that is a prized posession of mine. I can’t believe how big Emily and Abby have gotten! So big and soooo adorable!